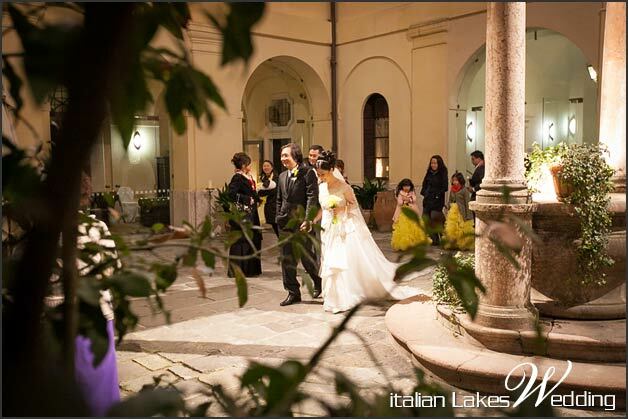 e come back to tell you about another romantic wedding in wonderful city of Verona. A wonderful city of art maybe the city that symbolize LOVE at its best. 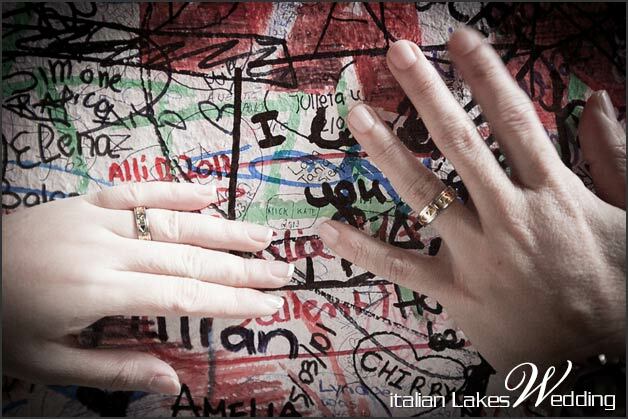 VERONA is the city of Shakespeare’s Romeo and Juliet and we are sure you will feel this romanticism all around there. 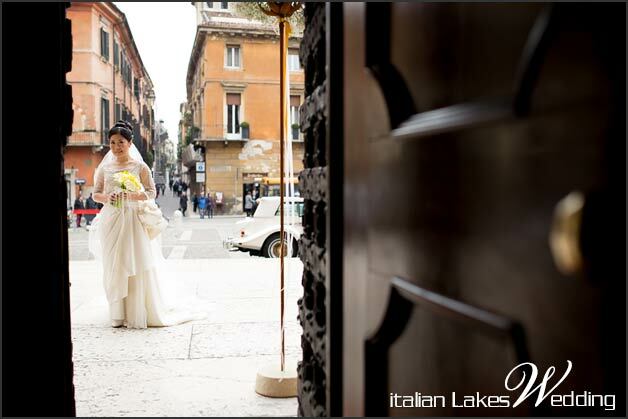 Recently a lovely lady called Kate contacted us to help her organising her dream – getting married in Italy. She had very clear ideas in her mind to start. 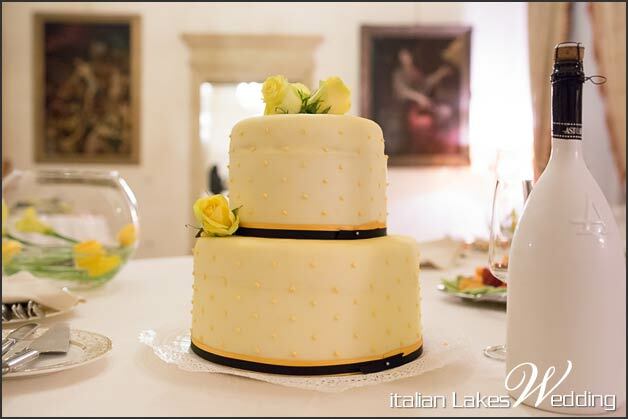 She wanted a yellow and black themed wedding. We got immediately fascinated by this original colour scheme. It totally allowed us to indulge our creativity. 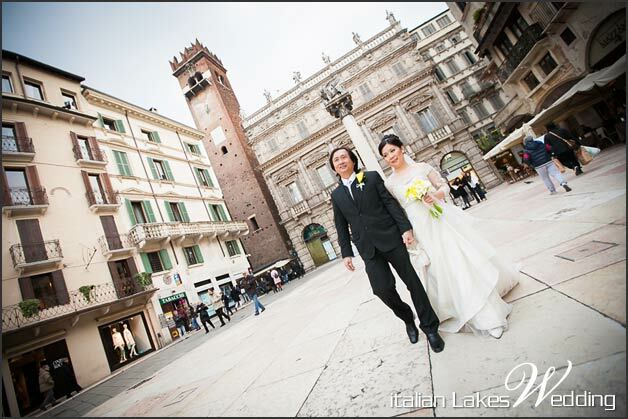 Kate and Nixon decided to get married in March in romantic setting of Verona. 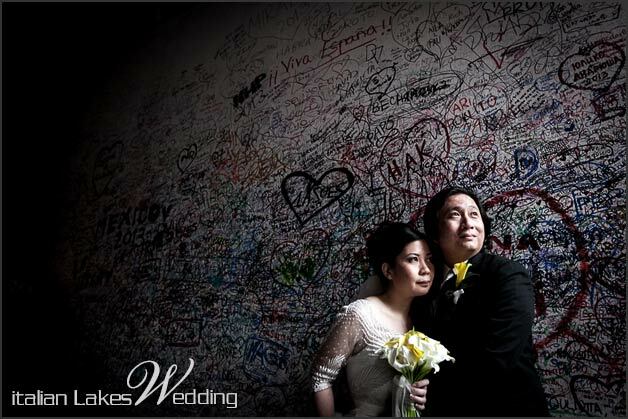 They chose the home of the most famous lovers in the world: Romeo and Juliet, as the backdrop for their great day. 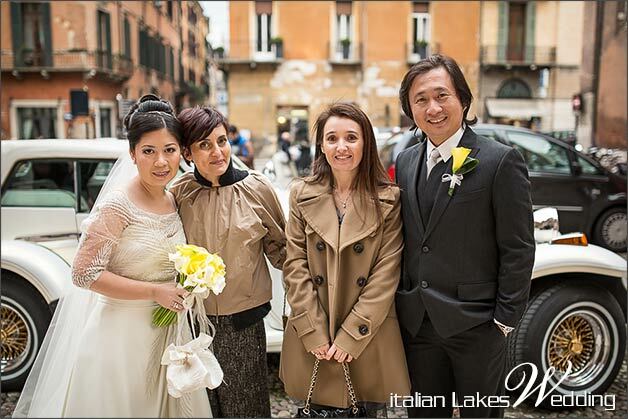 Guests came from Philippines celebrate with them this special day in Verona. 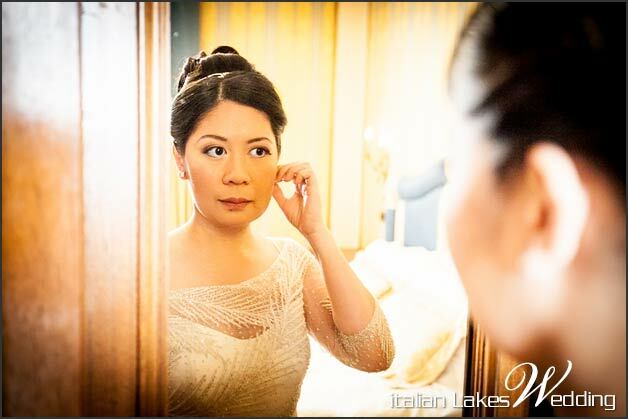 All the group including Bride and groom decided to get ready in the wonderful Suites of an elegant hotel at the heart of the old city. 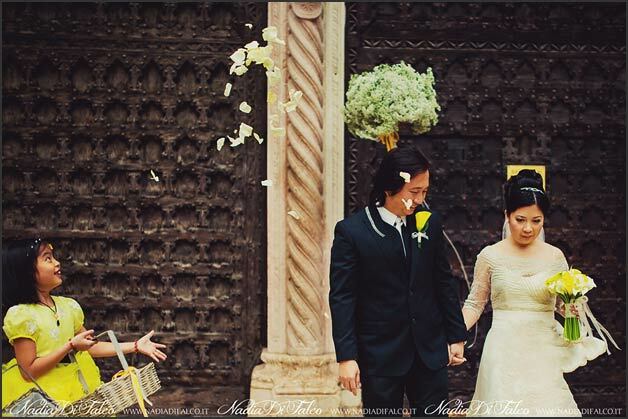 After getting ready for the ‘big day’ Nixon and guests walked to the church waiting for the bride. 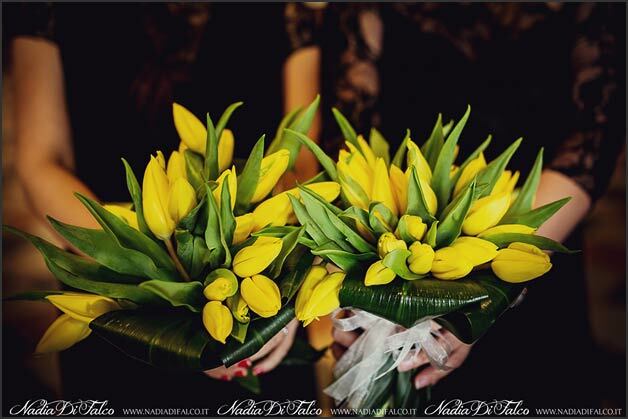 Respecting theme Kate wanted, bridesmaids wore black dresses with yellow sashes matching yellow tulips bouquets. 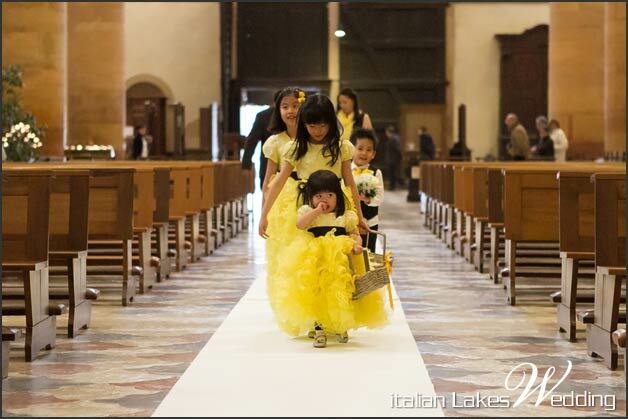 As a contrast flower girls wore yellow dresses with black details. 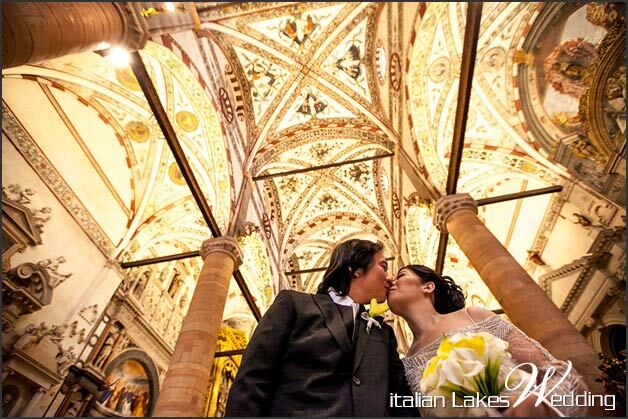 Religious ceremony took place in one of the most beautiful church of Verona: Basilica of S.Anastasia. 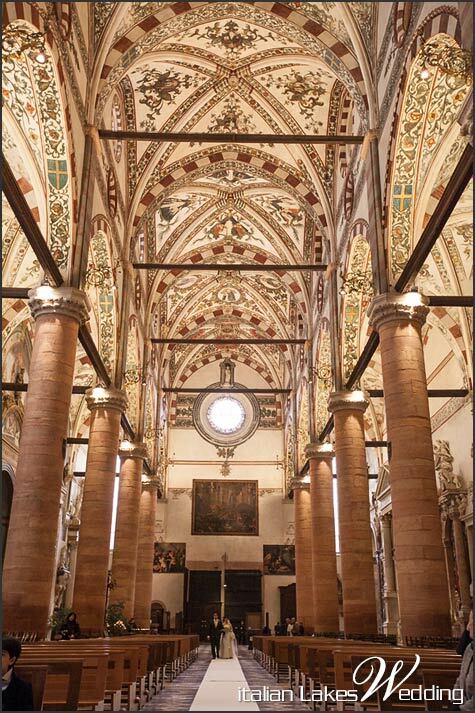 It’s a Gothic abbey, you can admire here ancient floor in three colours, black and white to remind Dominican monks’ robes and red taken by local marble. Just stunning! 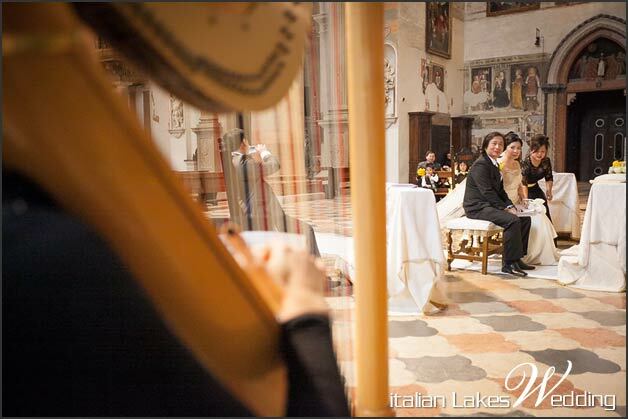 A wonderful singer accompanied by harp and violin added a great musical touch to the ceremony. 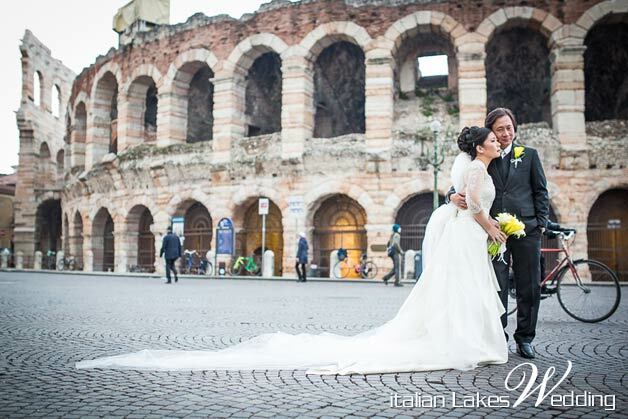 After the service Kate and Nixon with their guests went for a stroll through the beating heart of Verona, crossing Piazza delle Erbe and famous Arena Romana (also known as Arena di Verona), Castelvecchio and obviously Juliet’s house where they wrote their names among those who swears eternal love. 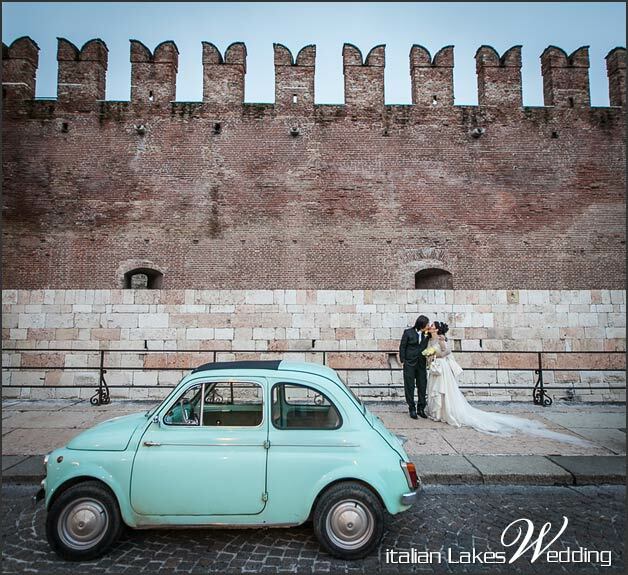 A white, vintage Excalibur Phaeton IV then took happy Kate and Nixon to an ancient castle built in XIV century, just a little outside of Verona for the wedding reception. 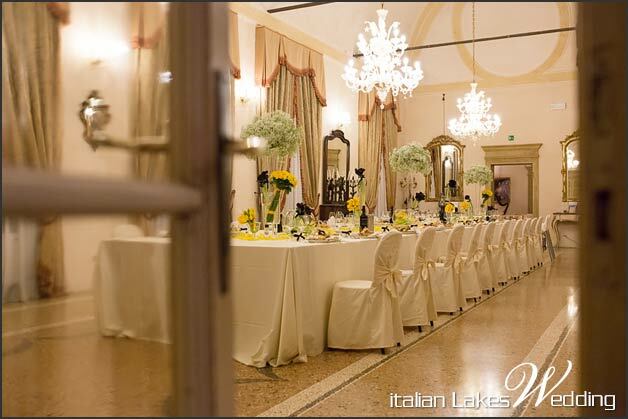 Yellow was the main feature here too, marching bridal bouquet of course! Calla lilies and tulips did the rest for the decorations of the reception contrasting with a trace of black that brought a touch of elegance and modernity to the occasion. 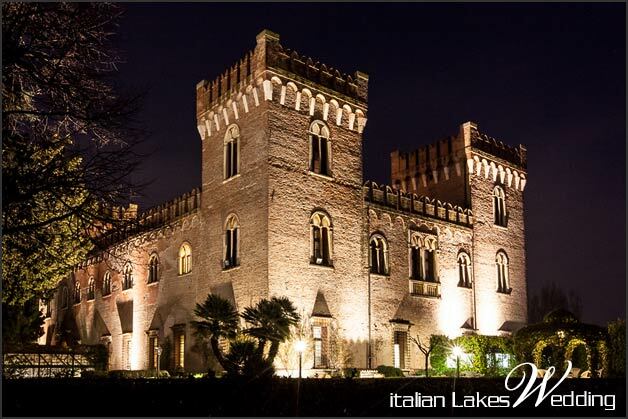 Canapés in the courtyard were followed by a fine dinner in the ballroom on the first floor of the castle. Names cards were made of hand-made papier-mâché masks which were also the wedding favour for each guest Kate and Nixon decided for. 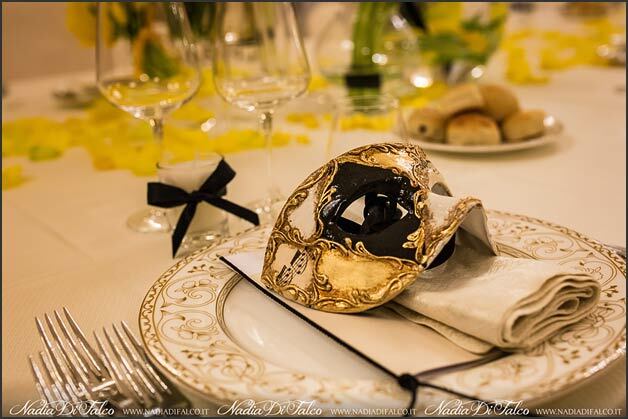 The mask were give as a special little gift to evoke bride and groom’s honeymoon destination: VENICE! Elegant and refined masks were made using original and antique Venetian techniques. 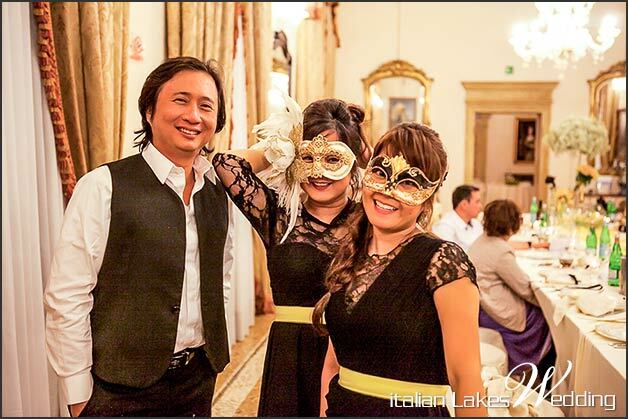 Masks intrigued and entertained the guests throughout the reception. A very original idea! 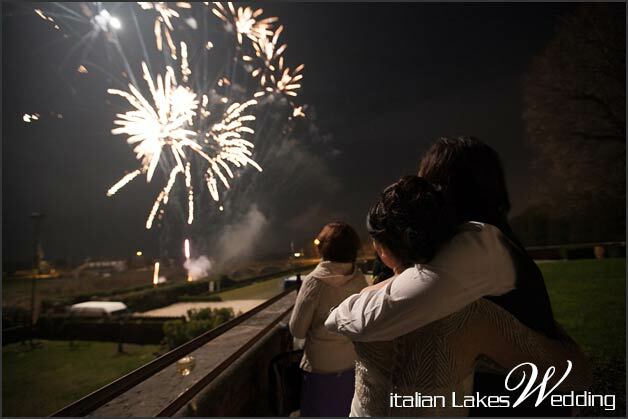 As a special surprise for all their guests, the Kate and Nixon planned an after dinner fireworks display in the castle grounds! As stunning show everybody will remember for a long time! 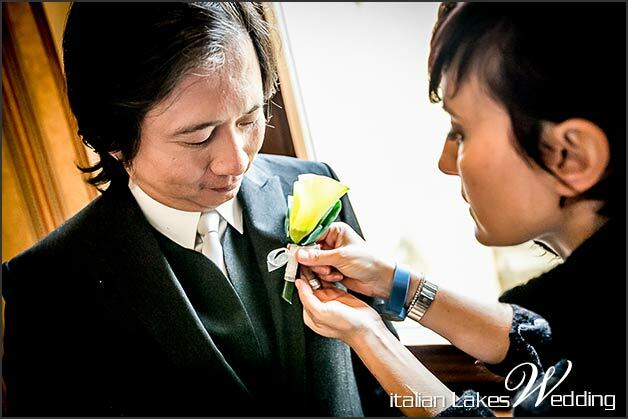 Kate and Nixon chose Enrico Celotto as their official photographer who added a touch of class and magic to the whole event. 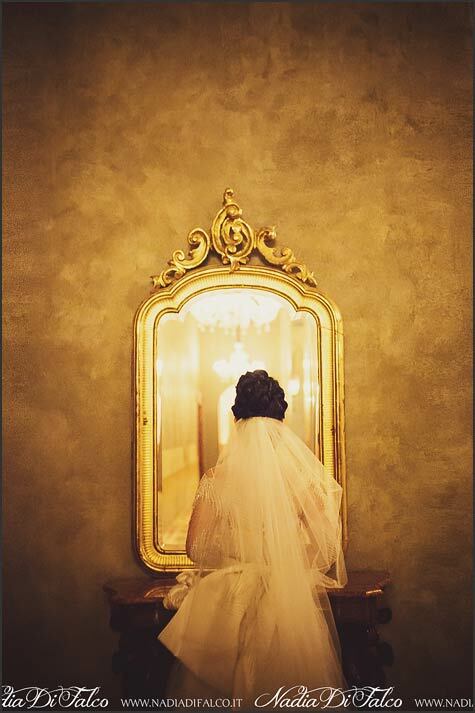 Just have a look to amazing photos he took. 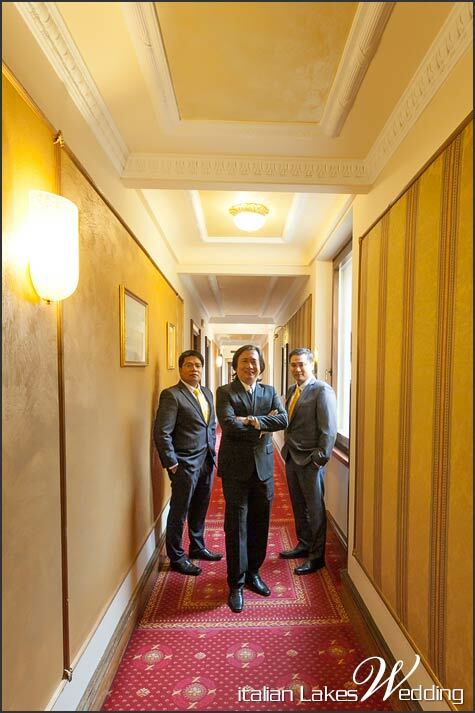 A very special thank to him and his great colleague Nadia Di Falco for the beautiful shots! And most of all congratulations Kate & Nixon!! 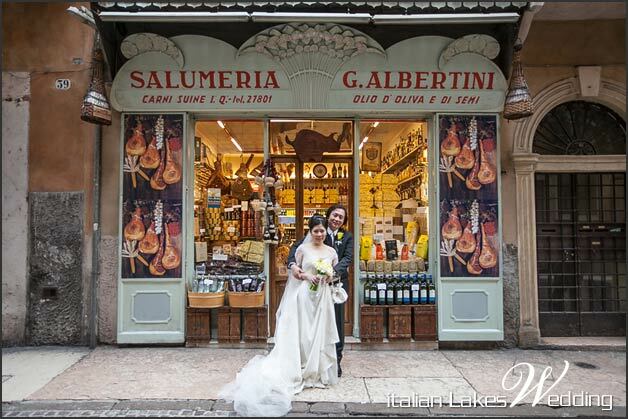 Your wedding in Verona will always stay in our hearts! 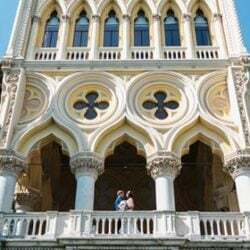 ← Madonna del Sasso Church and a sweet Brazilian Couple!